The new Peugeot 208 Type R5 is set to be unveiled on 27th September 2012 at the Paris Motor Show, read on to find out more details about the engine and spec. 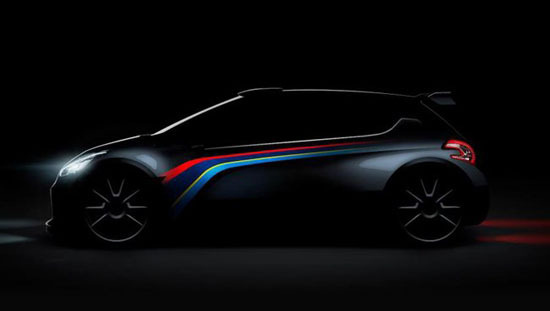 So far Peugeot have only released a single, dark and moody, image of the 208 Type 25 but what we can see is that it is proudly displaying the instantly recognisable Peugeot Talbot Sport livery which many of you will remember from the road-going Peugeot 306 Rallye and 106 Rallye as well as countless motorsport variants. The 208 Type R5 is the successor to the highly acclaimed 207 Super 2000 which has had numerous rally victories. The main difference between the two is the engine, rather than a 2.0 litre naturally aspirated unit, the Type R5 is equipped with the 1.6 litre four-cylinder turbocharged EP6CDT engine tuned to 280bhp and 295lbft. In an official press release, Peugeot have stated the engine choice is due to its durability, reliability and performance. The Type R5 has also been on a diet and is 40kg lighter than its predecessor. We can only speculate about exact weight but the minimum weight for the R5 class is 1200kg, so I suppose the question is how close will Peugeot get to that? Even at 1300kg the 208 Type R5 would have a sprightly 219 bhp per tonne. The Type R5 is set to compete in the new R5 category which consists of Group A vehicles which are derived from production models which must have at least 25,000 sales to meet requirements. For the geeks amongst you here are the juicy technical details. Front brakes: Alcon 4 pistons - 300mm diameter (gravel) 355mm diameter (asphalt). Rear brakes: Alcon 4 pistons - 300mm diameter (gravel) 355mm diameter (asphalt).